I picked up a little information while surfing on the Internet for Warhammer 40K news today. And guess what? This is what I found. Tau formations. Well, at least two of them are definitely formations, with the Firebase Support Cadre being a recycled one. Yeah, that's right. You heard it here first. Well, not exactly, I'm sure there are other websites with earlier and better up-to-date news than my blog, but I thought I'll provide a post where you can see all these awesome Tau bundles. One of them is a pretty old one, the old Tau Firebase Support Cadre, which if you remember, was one of the formations I was considering to ally with my Imperial Knights at the beginning of this year. Well, you all know how that went if you've been following my blog. I ended up selling my Riptide, Hammerhead gunship and Broadside for a pitiful amount of money, but at least it freed up space for my Adeptus Mechanicus army. YAY! Anyway, the first formation, which is most likely confirmed because it's on Games Workshop's official website, features the above mentioned Hammerhead Gunship, is the Armored Interdiction Cadre. "Sometimes, when diplomacy fails, massive firepower needs to take its place. In these situations, the Tau fall back on to their heavily-armoured plan B - the Armoured Interdiction Cadre. Screaming, roaring jet engines herald the arrival of the TX7 Hammerhead Gunships, and the Sky Rays assist them, streaking blue contrails peppering the skies with their messages of hyperspeed death. This awesome bundle gives you everything you need in order to field the Armoured Interdiction Cadre, as found in Codex: Tau Empire. You’ll receive three TX7 Hammerhead Gunships, bristling with seeker missiles, ion cannons and railguns, and one TX78 Sky Ray Gunship, featuring twin-linked smart missile systems and burst cannons." In other words, the Armored Interdiction Cadre is a formation that will be found in the new Tau Empire codex! We'll get to see it! I wonder if we'll get a Super Cadre formation much like the Necrons' Decurion Detachment or Space Marines Gladius Strike Force or Eldar Warhost Detachment or the Khorne Daemonkin Blood Host Detachment, so it'll probably include a Core Cadre consisting of maybe Ethereals or Crisis Commander and his bodyguard, and a bunch of auxillary cadres including the Armored Interdiction Cadre and hopefully the Tau Firebase Support Cadre. I suppose there will be a Pathfinder Cadre as well. Anyway, you can find more details or order the web bundle at the Games Workshop official website. The Armored Interdiction Cadre is available for order now so click on the link if you're so inclined. I have no ideas what rules and bonuses this formation receives, and we'll find out when the codex is on sale. "Barely any sight in the universe is as morbidly exciting as a Firebase Support Cadre in full swing. Supplied with optimal targeting data from sub-orbital drones, the pilots - amongst the most highly-skilled in the Tau Empire - calculate angles with preternatural speed. A single, synchronised fusillade rings out, shaking the ground and obliterating the target instantly. Even an Imperial Titan will struggle to withstand this incredible death blossom of sheer firepower, punctured again and again by staggering rail-rifle shells and fusion blasts until nothing remains but smoke and wreckage. Are you lacking in firepower? This is definitely the bundle for you! You’ll receive six XV88 Broadside Battlesuits - effectively an angry walking tank, too heavy for the quick movement afforded by repulsor jets, but quite content to replace those with thick armour plating and an immense arsenal of heavy weapons - and an XV104 Riptide Battlesuit, whose ion accelerator and arrays of missiles chew through enemies in short order. Seven mechanised destroyers who are sure to get your point across." Anyway, the rules can be found all over the Internet if you're so inclined. Basically the Riptide and 6 Broadsides (fielded in 2 units of 3) have the Tank Hunter and Preferred Enemy (Space Marines) special rules. The downside is that the Space Marines get Hatred (Tau Firebase Support Cadre) but obviously if you let your enemy's Space Marines get close enough for melee combat then you're playing Tau wrong. Anyway, as always, you can order an entire box of Firebase Support Cadre at the Games Workshop website by clicking on the link. Remember when I posted the news about the Stormsurge last Monday? I said you can take 3 of them in a single Lord of War slot, and surprise surprise! 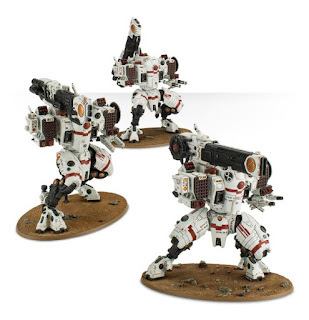 Games Workshop backed this up by selling a web bundle featuring a trio of Stormsurge ballistic suits! 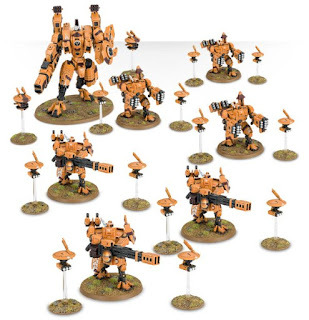 If you have the money and points, go ahead and add this delicious set of super-heavy Gargantuan Creatures to your Tau army and let rip with a devastating volley of rockets and pulse driver blasts. I do not know if this will be a formation but it sure sounds like one (Mobile Assault Force? Hmm...). It probably isn't, I mean, considering you can already take 3 in a single Lord of War slot and there's no "Cadre" in it, so why have a separate formation? So that you can take six of them in a single army? No. Just no. "Designed to bolster the frontline in the rapidly escalating war against the Imperium, the KV128 Stormsurge is an incredible feat of Tau engineering, capable of turning the course of a battle by simply letting loose a fusillade of missiles, or a concentrated burst from its pulse blastcannon. When a Stormsurge enters the theatre of war, the enemy would do well to take notice - and when this assault force of three makes its presence felt, entire planets fall. This awesome bundle will truly cement your place on the gaming table as a heavyweight - three KV128 Stormsurges, covered in brutally powerful weaponry and stabilising thrusters. 513 components in total, huge amounts of modelling and posability options - grab this bundle and not even a Titan will slow your advance." The description says nothing about a formation, which is a giant clue, unlike the Armored Interdiction Cadre. So yeah. I wouldn't get my hopes up and expect a formation for this. More than likely it'll be something like the Lord of Slaughter in Khorne Daemonkin or the Wraith Constructs, Heroes of the Craftworlds and Living Legends in Eldar Craftworlds. You can't take them as separate formations apparently. If you're really tempted to order this very attractive set of awesome Stormsurge suits, you can pre-order the Mobile Assault Force Stormsurge at the official website by clicking on the link. 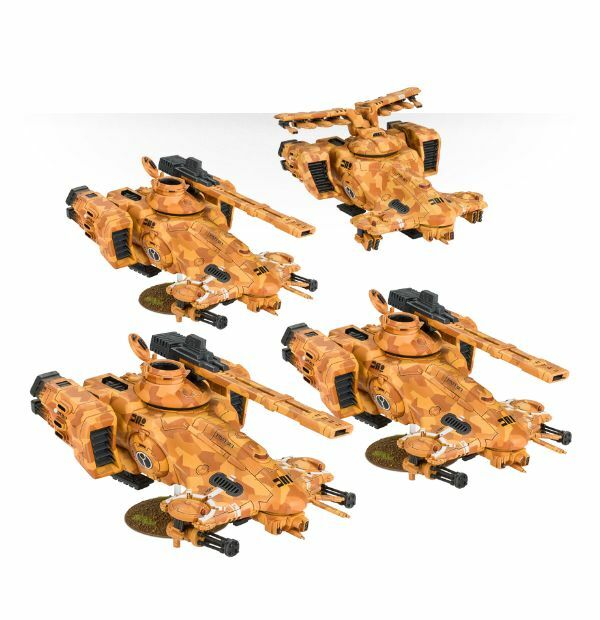 So that's the three newest web bundles available on Games Workshop for the upcoming Tau Empire release. I don't think you should stay tuned to my blog for more news and details because Faeit 212 and Bell of Lost Souls provide much more news and more comprehensive details than I can ever give. Go to their websites instead. I'm just an amateur with nothing better to do. You can probably tell from the horrible quality of my book reviews and stuff. If I can get my hands on any more news and information regarding the Tau Empire codex tomorrow, I'll post them up here. Otherwise, don't hold any expectations. Right now I'm reading Priests of Mars, so look forward to my book review of it when I'm done.